The Detroit River is one of the most important waterways in the Great Lakes system, according to NASA’s post. Iron ore from Michigan’s Upper Peninsula and Minnesota makes up almost half of the commodities that pass through the Port of Detroit. Large cargo ships can be seen passing through the busy corridor in this image. The river forms part of the U.S./Canadian international boundary. 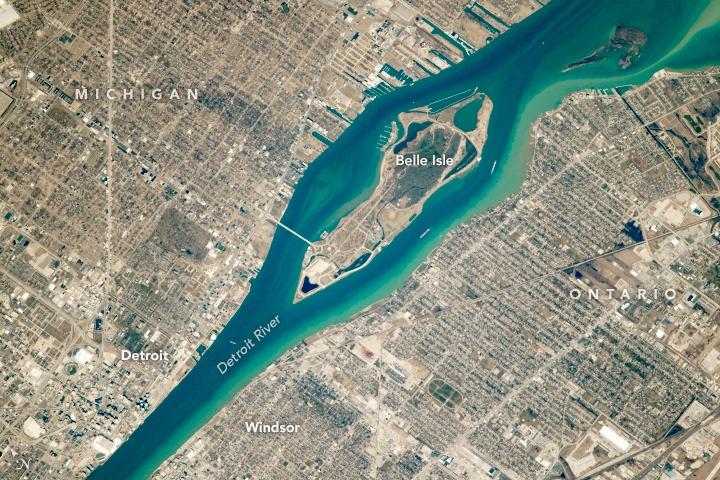 Belle Isle is entirely within the U.S.
Detroit, Michigan, and Windsor, Ontario, are across from each other. Both have long-standing connections to the automobile industry. Knight Center for Environmental Justice, Please help us Stop Grand Prix Racing on Belle Isle. Your efforts would be greatly appreciated.